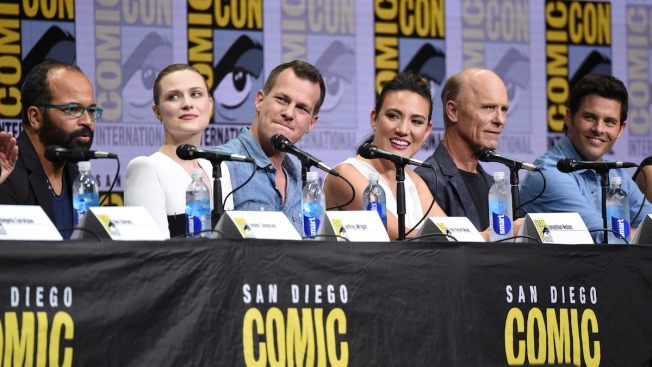 Jeffrey Wright, from left, Evan Rachel Wood, Jonathan Nolan, Lisa Joy, Ed Harris, and James Marsden attend the "Westworld" panel on day three of Comic-Con International on Saturday, July 22, 2017, in San Diego. Actress Evan Rachel Wood says working on "Westworld" changed her life. She says the series about a futuristic park manned by robot hosts where humans can live out their fantasies has inspired existential questions about her own life. She also says the powerful character she plays has empowered her off-screen as well. "It's so fulfilling," she said Saturday at a Comic-Con panel for the HBO show. "Because especially as women, and I don't know if this is true for men too, but a lot of times you feel as if your wings have been clipped and you're not being represented the way that you want to. And this was like just like somebody had given me (expletive) condor wings and I got to take off and fly." Wood appeared alongside showrunners Jonathan Nolan and Lisa Joy and her fellow cast members for a presentation inside the San Diego Convention Center's largest exhibition hall. Other cast members at the panel included Jeffrey Wright, Ed Harris, James Marsden, Tessa Thompson and Thandie Newton. Newton said she's been inspired and empowered by her role on the show, which recently received 22 Emmy nominations. "I'm so into the existential stuff on the show," she said. "In moment of chaos, when you think you know nothing, that's when gifts come. I just think that's incredibly profound." Though her character is an android prostitute, she gradually becomes more self-aware. Nolan and Joy said they parsed out their scripts incrementally during the first season so the actors wouldn't know too much about the story line or their characters' trajectories. Joy said her work on the show's second season has been inspired by the poetry of William Blake. Nolan added that he's been inspired by video games, including "Grand Theft Auto" and "Red Dead Redemption." The second season of "Westworld" is set to debut next year.